If you ask football fans to name the most difficult venues in the NFL for visiting teams to get a win you will get a list that includes the usual names: Lambeau Field, the Superdome, and even Qwest Field in Seattle. But even though most people don’t even know where M&T Bank Stadium is or who plays there, this site has been, in terms of against the spread success, the gold standard of home field advantage over the past decade. The Baltimore Ravens have been the beneficiaries of one of the most devastating home field advantages in football. The Ravens are 49-25-2 against the spread on their home turf over the last decade and they simply overwhelm visitors with their swarming defense and raucous fan base. That 66.2 percent success rate at home is the best in football, and I’m sure more than one person reading this is just kicking themselves for not taking more advantage over one of the simplest, most effective betting angles in sports over that time. Baltimore will get a chance to extend upon its decade of dominance this weekend when they host Houston in a Divisional Round playoff game. The Ravens and Texans will bang heads at 1 p.m. on Sunday in Charm City with the winner earning a spot in the AFC Championship Game. In keeping with the theme of the weekend, this game is a rematch of a Week 6 showdown that Baltimore dominated at home, 29-14. Houston actually held a 14-13 lead midway through the third quarter in that game and was down just 19-14 late. But two late scores helped the Ravens pad their lead and made the game seem like more of a blowout than it actually was. However, Houston had starting quarterback Matt Schaub under center in that game. They will bring rookie T.J. Yates to this gunfight and the play of the inexperienced quarterback will ultimately determine Houston’s fate. Yates has been the starter for seven straight weeks and has performed better than expected, posting a rating of 80.7 while completing over 61 percent of his passes. Yates was solid last week in the Texans’ 31-10 romp over Cincinnati. But he had at least one clear interception dropped last week. And in his starting tenure he has been bailed out by either defensive penalties or missed opportunities to negate turnovers. Baltimore’s defense doesn’t miss those opportunities. The Ravens have been preying on weak quarterbacks for more than a decade and their three defensive touchdowns led the NFL in the regular season. Defense, and capitalizing on offensive mistakes, should be the theme of this game. Houston enters the contest with the No. 2 total defense in the NFL while Baltimore is No. 3. Both teams are in the Top 5 in football in rushing defense, passing defense and scoring defense as well. Offensively, these are two of the Top 10 running games in football and both teams will want to pound the ball on the ground and rely on their punishing defense. But Baltimore will have to move the ball in the air, and that means their playoff future will once again come down to Joe Flacco. Flacco has had his worst season since his rookie year and has completed just 57.6 percent of his passes this year. He has turned the ball over an average of once per game and hasn’t been able to effectively throw the ball down the field. Flacco is 4-3 as a starter in the playoffs. But he has completed just 53.3 percent of his passes in the postseason with four touchdowns and seven interceptions. These two teams are even in terms of running games, defense and special teams. But Flacco’s experience (and the home field) is the biggest advantage Baltimore has. But he will need to be better than he has in past January’s if Baltimore is going to advance. Not surprisingly, the Ravens are a solid nine-point home favorite, according to NFL odds. The spread actually opened at 7.5 but was either bet up or released high at the majority of books. The present number has been a solid one, with a nearly 50-50 split on the action in this game. The total for this game has experienced a tremendous move. This total opened at 38.0 but the ‘under’ was pounded and the line dipped to just 35.5. That represents the biggest move of the playoffs so far. Baltimore obviously has all of the playoff pedigree in this game. However, they are just 1-4 ATS in their last five Divisional Round playoff games. They are 4-1 ATS as a favorite but, despite their decade of dominance, they are just 1-3-1 ATS at home. Houston has covered three straight games as an underdog and they are 4-0-1 ATS in their last five games against a team with a winning record. The Texans have posted a healthy 7-2-2 ATS mark overall in their last 11 games and they are 5-1-2 ATS in conference games. However, Houston is just 1-4 ATS in its last five matchups with the Ravens. 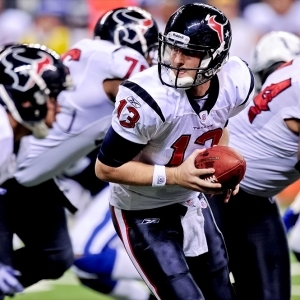 It is too easy to say that T.J. Yates and the Texans don’t stand a chance in this game. After all, Baltimore dominated the first meeting against Houston’s starting quarterback, right? So they have no shot with a backup. But I don’t think that’s the case and I think that there may be some value in the points for anyone with the stones to bet against the Ravens on their home turf. Baltimore’s defense isn’t exactly explosive, and it offers nothing that the Texans stellar defense hasn’t seen before. In the 11 games since the first meeting Baltimore has only won by 10 or more points three times; once was against San Francisco and the other two “blowouts” were against the Colts and Browns. I think that Yates is able to avoid making more than one big mistake in this game. I think that Houston is going to be able to move the ball a bit and that they are going to be able to compete with Baltimore, physically. I don’t think I would make a major move on this game, but my initial feeling is to say to take the points and look for this one to stay tight.